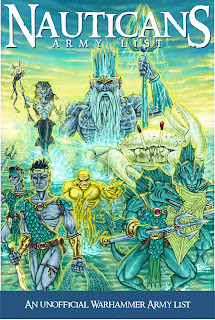 We are planning to make several changes to the Nautican Army "Book" this weekend (6th-8th Nov 09). There has been a lot of playtesting since the last update and many unit discussions. - A sprat hero (I'm not sure hero is the right word !). Who can lead a unit of coral hunters thus making them skirmishers or a unit of Crest Riders thus improving their Breaking Wave charge. The hero will be able to join other sprat units throughout the game. Several Changes to magic items, including new items, simplification and removal of others. This is to make the magic items more selectable and balanced. Probably removal of Deep Divers which have been superseded by sprats that did not exit prior to the deep diver's inclusion. Also, Octobipods with their poisonous attacks have, to some extent, reduce the need for raged poison weapons. We would really like to include some dolphin mounts in the army but sourcing the models is proving a real pain unless you fancy paying for some solid silver ones ! If anyone knows where we could get our hands on 28mm lead/tin dolphins we'd really appreciate it if you let us know ! I'm working hard on getting all this done in time, thanks for your patience so far. PS. One last thing, once the army list has been updated I will re-activate the voting polls on the right of this blog so please cast your votes so we have an idea what you make of the new army list.